The Max Cure Foundation is honored to be teaming up with lululemon athletica in East Hampton during the holiday season to make a difference in the lives of children battling cancer. Instead of doing a food or clothing drive, the team has decided it was time to “mix it up” a bit and hold a sneaker collection. “lululemon athletica East Hampton is honored to be partnering with The Max Cure Foundation’s Dunk Your Kicks campaign for pediatric cancer! Our team has put together clothing drives in the past, but this year we wanted to run with an idea we have been toying with the past few years. We have a large community of runners on the East End. Many avid runners change their sneakers every few months, but what happens to those perfectly good sneakers? The Max Cure Foundation has provided a solution: recycle them and raise money for necessary pediatric cancer research and patients! Aside from raising money for cancer research, this project provides an important service in the name of sustainability. Sneakers are recycled and given to those in need, and the sneaks stay out of landfills. It’s a win-win!” exclaimed Assistant Store Manager, Alyson Follenius. When you go by lululemon athletica and see a clear box full of sneakers in their front window know that for every pair collected, The Max Cure Foundation will receive $1 towards the Roar Beyond Barriers NYC program. Roar Beyond Barriers started when the Plotkin family realized that cancer does not discriminate. It does not matter if you are a Wall Street Tycoon or a single parent living in the inner cities. Cancer hurts, not only the child but the family as well, both emotionally and financially. When they recognized the battle some parents have in addition to the cancer, they decided to help and with that the Roar Beyond Barriers was created. Thanks to the sneaker collections and donations, we are able to provide low-income and military families who have a child battling the disease with monthly gift cards. Max Cure currently provides assistance to 50 families in 12 states and 21 hospitals. 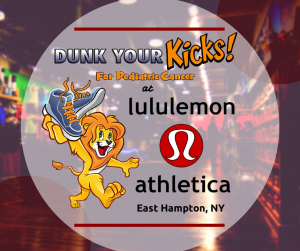 So clean out your closest, dig out those old running shoes, stop by lululemon athletica East Hampton and #DunkYourKicks for pediatric cancer. NEW YORK, NY – The Max Cure Foundation, a national pediatric cancer foundation, is pleased to announce that The New Jersey Running Company and CrossFit TreeHouse in Kenilworth, NJ have chosen the pediatric cancer foundation to be the beneficiary of their TRACK FRIDAY events. 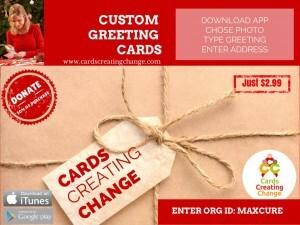 The Max Cure Foundation is a non profit children’s cancer charity whose mission is to raise money to fund the development of less toxic treatments for children and also to provide financial support to low-income and military families who have a child battling cancer. Both organizations will be collecting sneakers for MCF’s DUNK YOUR KICKS campaign, a national campaign to collect new and gently used sneakers for a recycler who sells those sneakers to exporters/distributors as part of the Affordable Clothing Market. MCF receives $1 per pair for facilitating the collection. Track Friday’s mission is to create a national charitable giving event held annually on the day after Thanksgiving to inspire philanthropy, health, and community. Track Friday participants can support any charity, raise any amount, and run or walk any distance on any track, at any time of the day on Track Friday. The Track Friday team will be hosting a flagship event at Middletown High School North in Middletown, NJ. They will be collecting sneakers at this location. But Track Friday is a virtual event as well, with participants even planning “meetups” at tracks anywhere! Visit the website for meet up locations. Thanks to CrossFit TreeHouse and The New Jersey Running Company, Dunk Your Kicks is becoming a big part of the Track Friday Experience. New Jersey Running Company – Hoboken, Princeton Running Company,Westfield Running Company, Summit Running Company, Ridgewood Running Company and the Morristown Running Company. CrossFit TreeHouse is doing a Workout of the Day (WOD) in support of Max Cure Foundation. Their fundraising page is at http://www.razoo.com/story/Crossfit-TreeHouse. You can Dunk Your Kicks at Crossfit TreeHouse through the end of the month at 725 Lexington Ave, Kenilworth, NJ 07033 or at their Track Friday event located at the David Brearley track at 401 Monroe Ave in Kenilworth.